A key step in your SaaS sales funnel is getting visitors to sign up for your free trial. But when the trial period ends and it’s time for your users to take out their credit cards and pony up for your software, how many of your leads are converting? But no matter where your conversion rate is compared to these averages, you can always improve your conversions with better email marketing tactics. Here are 4 tips to help you convert more users by avoiding common SaaS email marketing mistakes. Hate to break it to you, but autoresponders are dead. 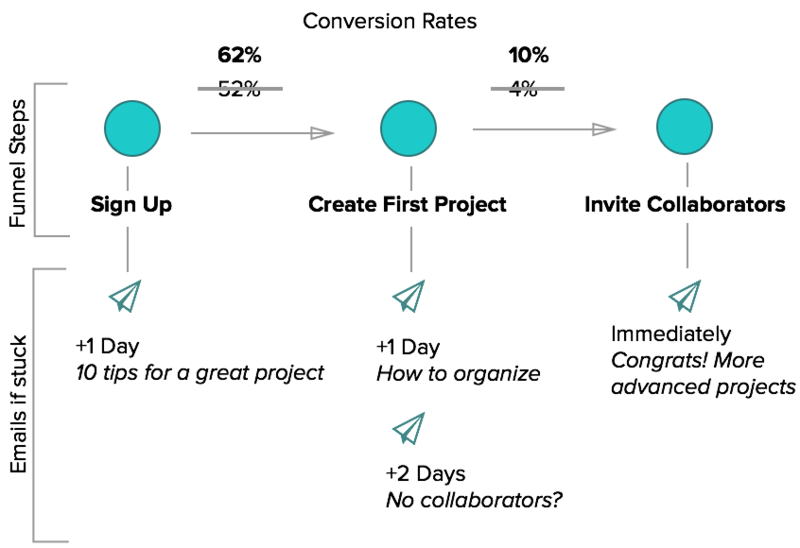 According to Lincoln Murphy at SixteenVentures "If you're still sending emails based on a timed sequence instead of triggered by actual user behavior, you're 100 percent doing it wrong." The number-one problem with time-based drip emails (autoresponders) is that the same message gets delivered to every user. That includes your most active users and people who have completely forgot they signed up for your free-trial. The truth is that each user moves through your funnel at his or her own pace. 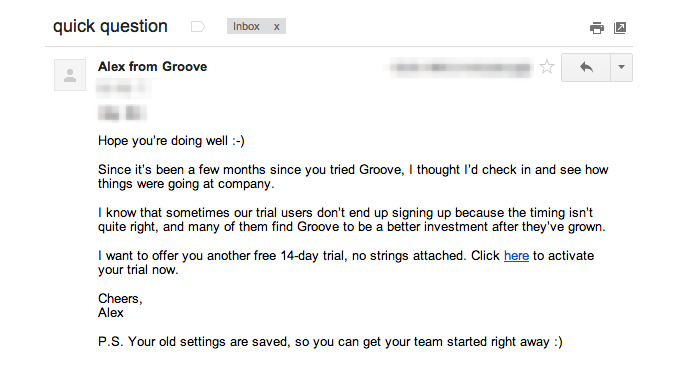 So why send users emails based on a random number of days that have passed since they signed up for your trial? It takes more effort to set up an action-based email campaign, but it pays off. 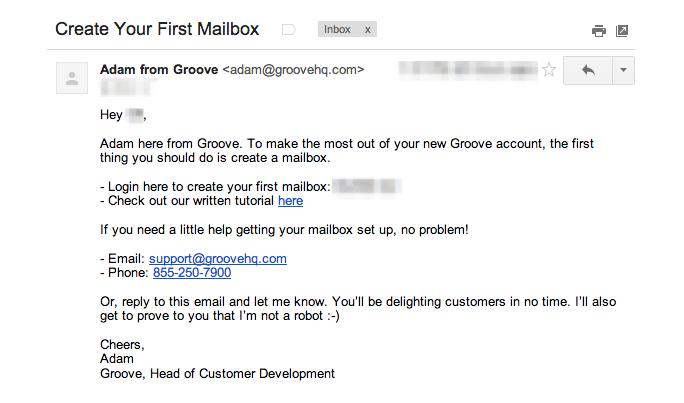 GrooveHQ improved its end-of-trial conversion rates by 10 percent when it switched to an action-based email campaign. 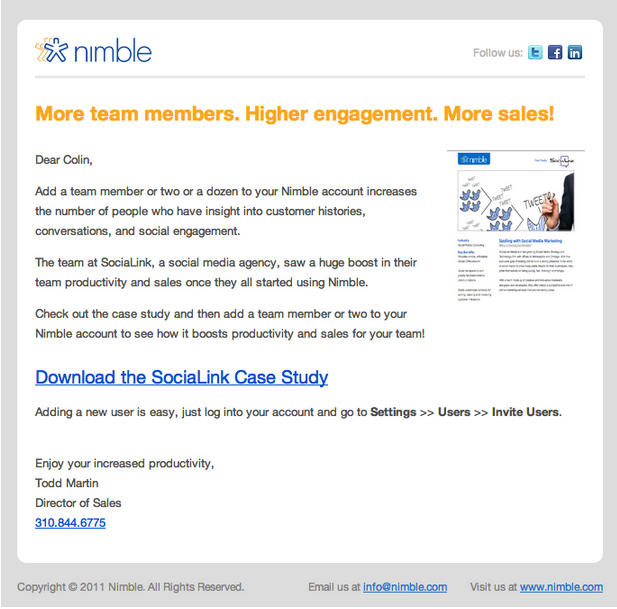 This email first makes it obvious how Nimble can improve its users' sales and productivity, and then it explains how to add a new user. Mistake #3: You’re not sending emails when your leads get “stuck"
Patrick McKenzie found that 40–60 percent of free trial users (for almost every SaaS company) will log in once and never come back. Obviously, not everyone who signs up for your free trial will fully engage with your app. But that’s why it’s so important for your behavior-triggered email campaign to re-engage your users. Bottom line: When you see users getting stuck, send them emails that inspire them to take the next step. For example, Buffer used its analytics to discover that users were more likely to churn when they had no future posts scheduled. 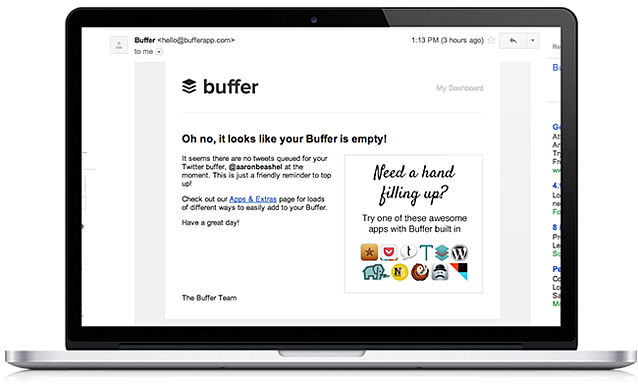 So Buffer started emailing customers at this point. Don’t be afraid to follow-up with these users if they don’t respond to your first triggered email. 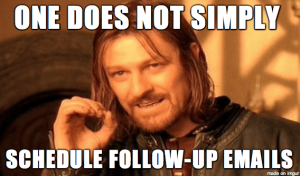 A study by Experian found that follow-up emails resulted in an average 54 percent increase in conversions. Just because a user didn’t convert during the free trial, doesn’t mean he or she never will. Users might need more time to decide or they might simply be too busy to sign up when their trials ended. 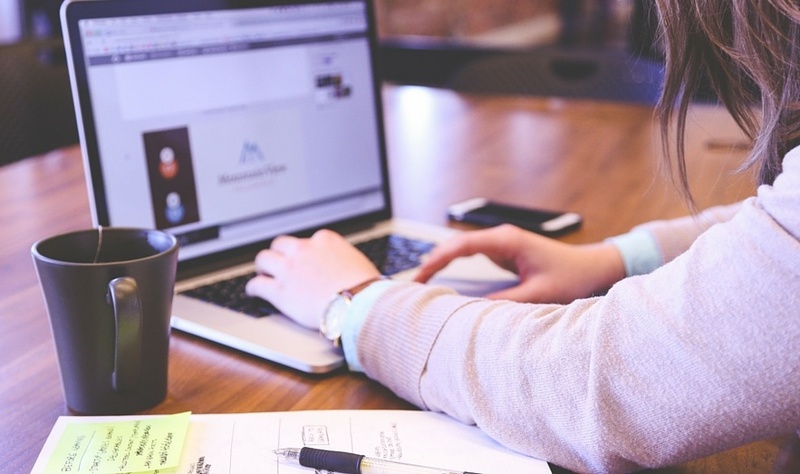 Don’t forget about your free trial leads that didn’t convert. You’re leaving money on the table every time you do. Instead, continue sending awesome emails (as long as you have their permission, of course). The company sent this email 90 days after the free trial. It converts at around 2 percent. And while 2 percent is no landslide victory, that’s still winning back 2 percent more customers that would have been lost. Jack is a SaaS email and B2B marketing expert and is the founder of Emails That Sell, an email marketing agency built for business owners or marketing executives who want to grow their company, but they're not exactly sure how to do it.